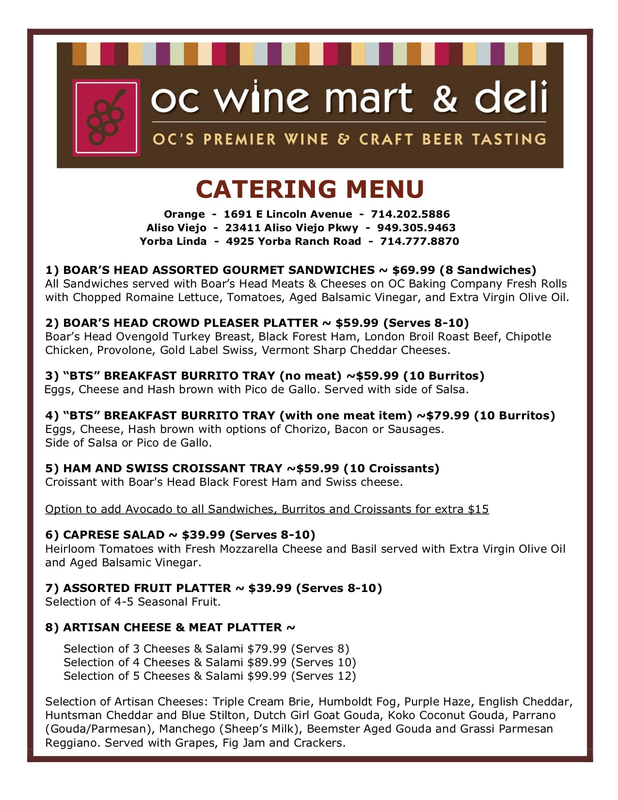 All Sandwiches served with Boar’s Head Meats & Cheeses on OC Baking Company Fresh Rolls with Chopped Romaine Lettuce, Tomatoes, Aged Balsamic Vinegar, and Extra Virgin Olive Oil. Boar’s Head Ovengold Turkey Breast, Maple Glazed Turkey Breast, London Broil Roast Beef, Chipotle Chicken, Provolone, Gold Label Swiss, Vermont Sharp Cheddar. Eggs, Cheese and Hash brown with Pico de Gallo. Served with side of Salsa. Eggs, Cheese, Hash brown with options of Chorizo, Bacon or Sausages. Side of Salsa or Pico de Gallo. Croissant with Boar's Head Black Forest Ham and Swiss cheese. 6) CAPRESE SALAD ~ $39.99 (Serves 8-10)Heirloom Tomatoes with Fresh Mozzarella Cheese and Basil served with Extra Virgin Olive Oil and Aged Balsamic Vinegar. Selection of 4-5 Seasonal Fruit. Selection of Artisan Cheeses: Triple Cream Brie, Humboldt Fog, Purple Haze English Cheddar, Huntsman Cheddar and Blue, Stilton, Dutch Girl Goat Gouda, Koko Coconut Gouda, Parrano (Gouda/Parmesan), Manchego (Sheep's Milk), Beemster Aged Gouda and Grassi Parmesan Reggiano. Served with Grapes, Fig Jam and Crackers.